I have written about Wright Brothers in Borough Market before, but that was about 3 years ago, so it is time for a refresher. After a scrumptious Monmouth coffee and a stroll around Borough Market, we got ourselves a table at Wright Brothers for some fresh seafood lunch. We got the fruit de mer petit platter to share between us and a bottle of white wine. There were whelks, winkles, prawns, shrimps, oysters, clams and mussels presented on a bed of ice. It was all so fresh and reminded me so much of the seafront restaurants in Cannes in the South of France. 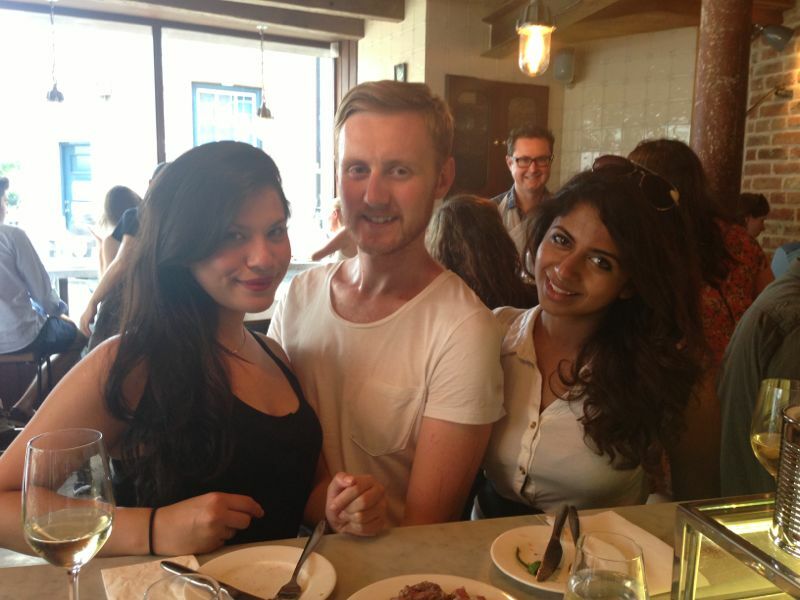 We chatted away and nibbled on fresh seafood for ages – it was a really relaxing vibe and the waitresses and waiters were really friendly and helpful. A must try if you haven’t been yet! I wrote about the authentic Indonesian restaurant in Soho called East West Oriental a while ago, but unfortunately they closed down last year. Well, the guys that worked there opened up their own Indonesian restaurant in Bermondsey called Warung Padang. It is a wonderfully authentic experience of Indonesian cuisine. Its a laid back atmosphere where everyone is friendly, the food is freshly made and absolutely delicious, and it is really well priced. I recently went with Rebecca and we missed Indonesian food so much that we felt the need to try everything so we ended up ordering the whole menu. Or most of it anyway. We had some prawn crackers with chili sauce, a Vietnamese Coffee (which is a strong filtered coffee that is mixed with condensed milk), a Nasi Padang Special (white rice with a couple of curries from the Padang region in Indonesia), and a Mie Bakso (a meatball and noodle soup). We obviously ordered too much and had to take the rest home with us but it was all gorgeous and really reminded me of Indonesia – I almost forgot that I was in London. Glorious! 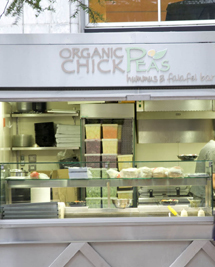 Canary Wharf is mostly full of character-less franchises, which (as I have said before) are not my favourite – but I have come across a little gem; a little falafel stall, just a short stroll from my office. Every lunch time the queue is massive and the smell is mouth watering. So, one Fat Friday (I swear it is an international holiday that everyone must celebrate at work on Fridays at lunch time), Romola and I joined this queue for these falafels and before we knew it we were at the front of the line and ordering away. Everyone loves a falafel. Those crunchy, deep fried balls of spiced vegetarian love are always a great time! 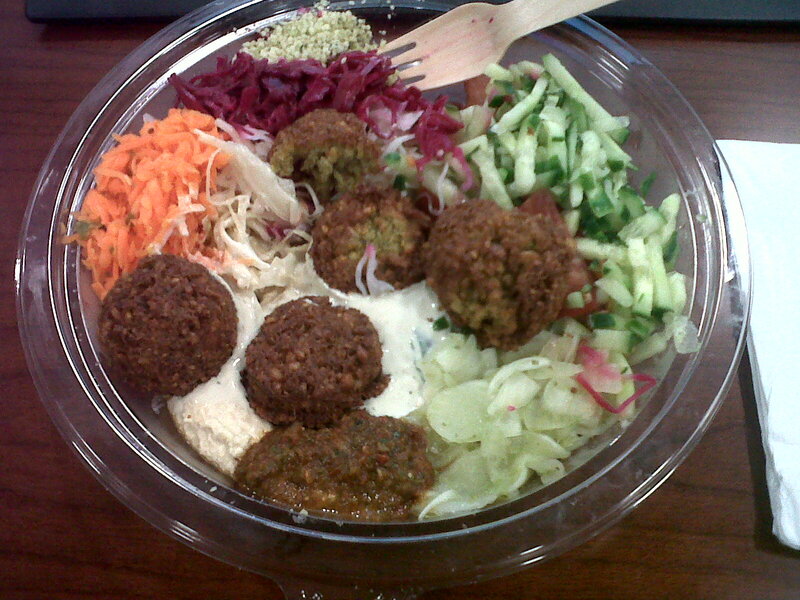 I ordered the falafel salad (£4.95), which consists of a cucumber and tomato mixture, pickled red and white cabbage, grated carrots, a very little spoon of couscous, hummus, chili sauce, pickled sliced onion, five falafels and a little dollop of tahini/yogurt. Romola had the falafel wrap, which she said was very good. The falafel were still warm and had a lovely crunch to them on the outside and a nutty texture on the inside. The base of the salad was very refreshing and all the flavours went very well together and the chili was deliciously spicy. It ended up being surprisingly filling as well. An excellent fat Friday lunch time find! One of my childhood best friend’s, Rebecca, and I had a catch up / congratulatory lunch (she just got a new job!) 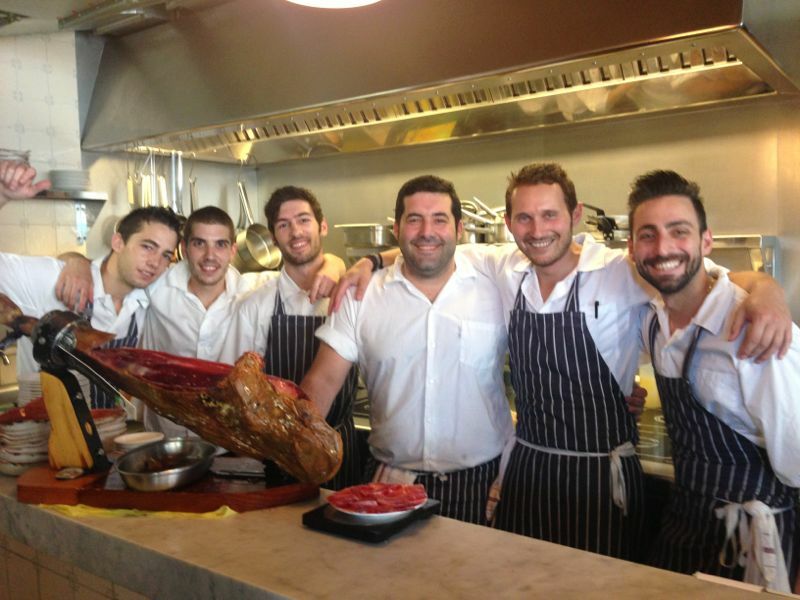 one sunny Saturday afternoon at Jose Pizarro’s Sherry and Tapas Bar, Jose, on Bermondsey Street. Rebecca’s gorgeous housemate Jack is one of the managers there and we decided to go on a day that he was there too. The staff at Jose are like one big family, which makes the place very special and gives it a happy, cozy, community-like feel to it – “where everybody knows your name” (Cheers, TV Series 1982–1993). The menu is up on the chalk boards and Jack ran through it all with us. The staff are passionate about their food, wine and sherry, which I could definitely tell as soon as soon as Jack started speaking about the food on the menu and the freshness of their produce. Rebecca and I decided on a glass of Petit Sios, Chardonnay/Sauvingnon Blanc/ Muscat, Coster Del Segre (£6.50 per glass). Jack recommended this after I explained what kind of wine I like – he obviously knows his wine as well as his food! It was lovely and went very well with our dishes. 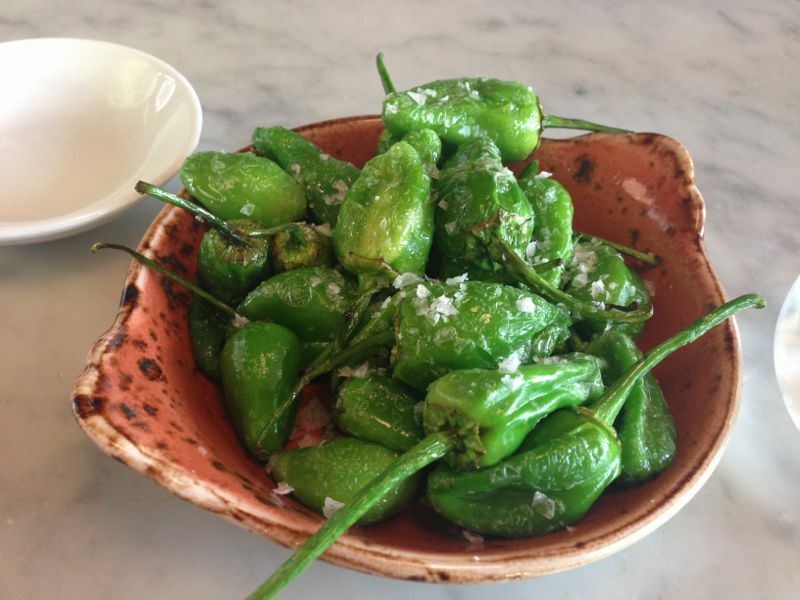 The padron peppers (£4), like everything else, was fresh in that day. They were cooked perfectly – simply grilled with sea salt sprinkled over it so I could really appreciate the natural taste of it. 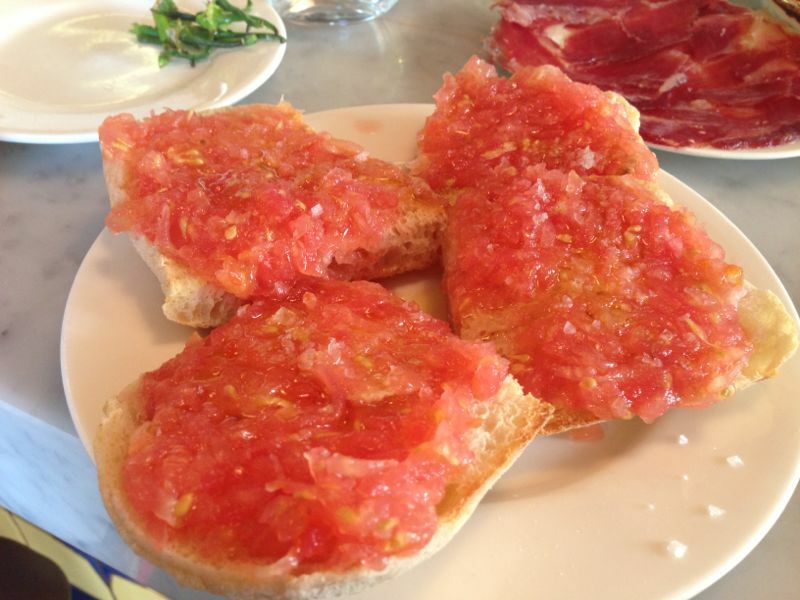 Some pan con tomate (£3.50), which were fresh tomatoes served on some ciabatta bread with sea salt sprinkled over. They were very refreshing and fresh tasting. 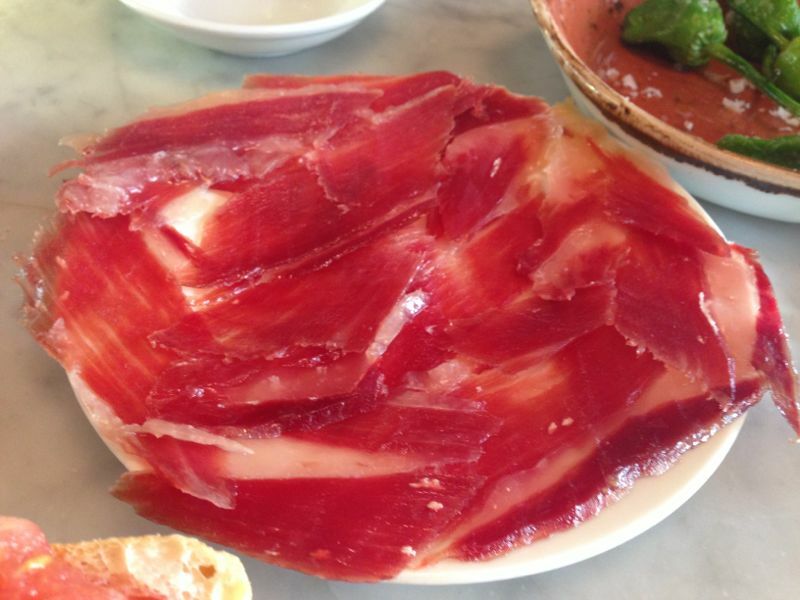 And of course what is tapas without some acorn fed iberica ham, freshly, thinly sliced (£9), which went very well with the pan con tomate. 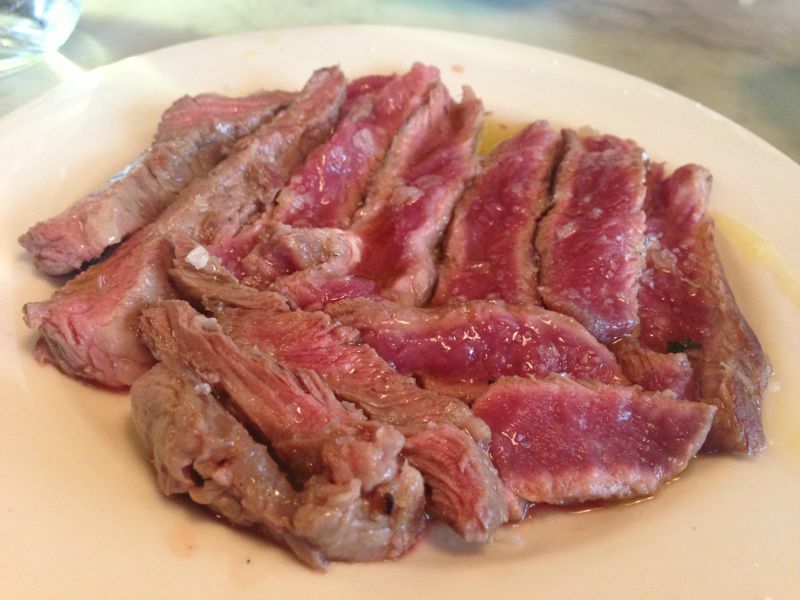 Rebecca’s favourite is the pluma iberica (£9.50), which is a rare steak with only olive oil and sea salt sprinkled over it so you can really taste the quality of the meat and is delicious. 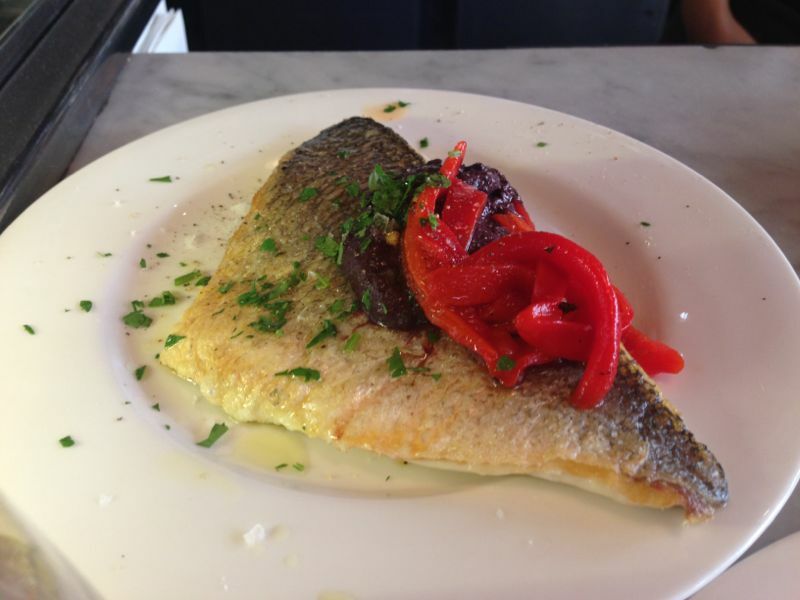 The seabream and black olive tapenade (£7.50) was delicious. I wouldn’t have thought of this combination but it all went very well. The seabream was cooked to perfection, the fish melted in my mouth and the skin was crisp! The tapenade gave a great smokey flavour and it was topped with roasted red peppers – Great combination! Jack highly recommended the tomato salad (£6) because of the variety and quality of the fresh tomatoes that they had in that day. 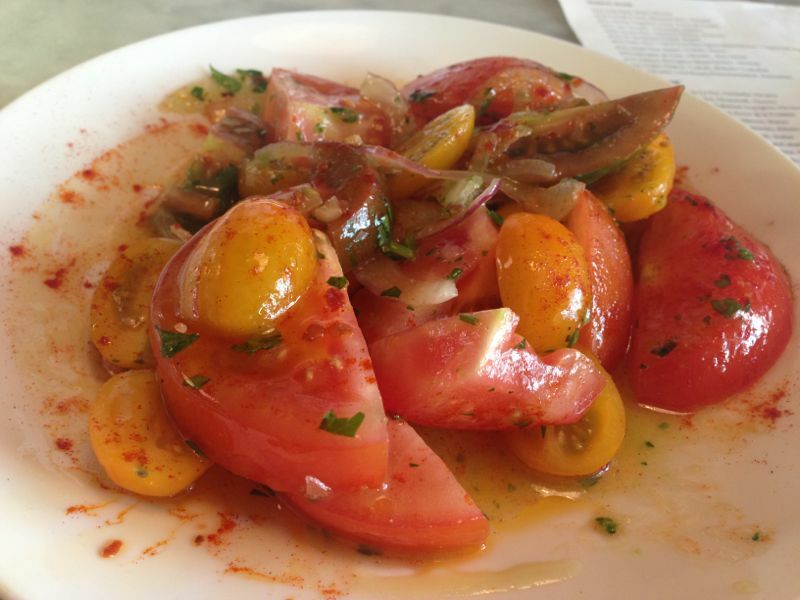 It was surprisingly really good for a salad just consisting of different types of tomatoes. The dressing was made up of a honey mustard and really complimented them. We finished off our meal with a glass of sherry. I am not a sherry person, so Jack introduced me to the world of sherry, explaining the different types. I explained that I dislike sweet drinks and I prefer something more dry so he recommended a Fino Clasico, Fernando de Castilla (£4 per glass), which took a couple sips to get into it, but it was quite a nice ending to my meal. Rebecca is more of a sweet tooth so she went for a Oloroso East India Solera Lustau (£6 per glass), which to me was a little too syrupy, but I can see why it would be a good finishing touch to a meal. Overall it was a lovely afternoon. 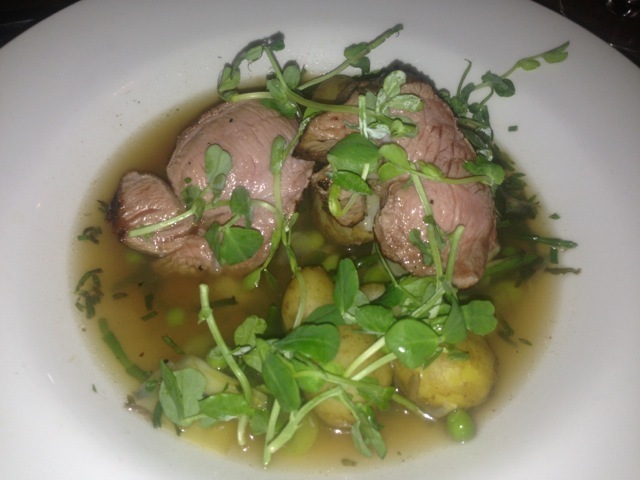 The food was all about the freshness of the produce and the natural flavours – Which I personally love! Thank you, Jack, for a delicious experience! After a long week of hard work, Thomas, James and I went for some post work drinks in The Wharf (As I work there now and they are my only friends that work there too). We sipped our drinks in the sun on the square and watched the Wimbledon Men’s Semi-Finals, which was showing on a huge screen on the square. 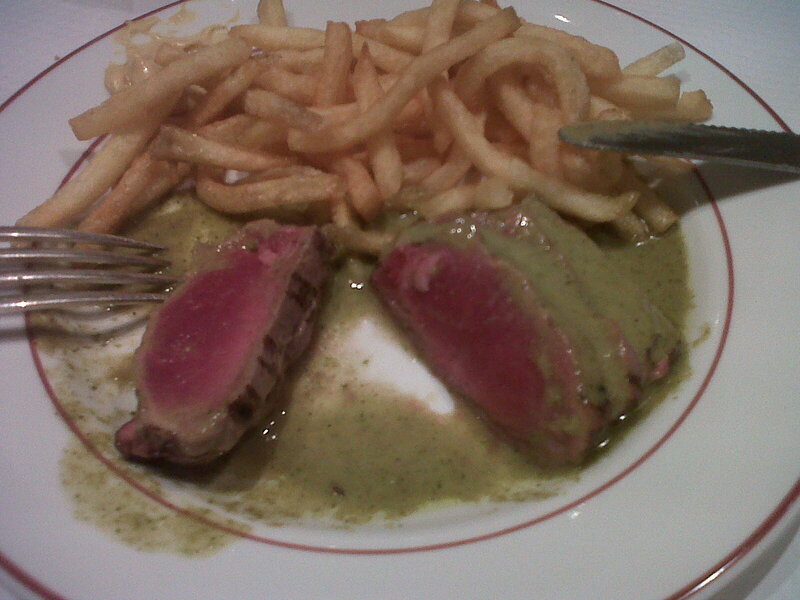 When we were done sipping, we decided we were extremely hungry after this very long day at work, and Thomas recommended we go to L’Entrecote. 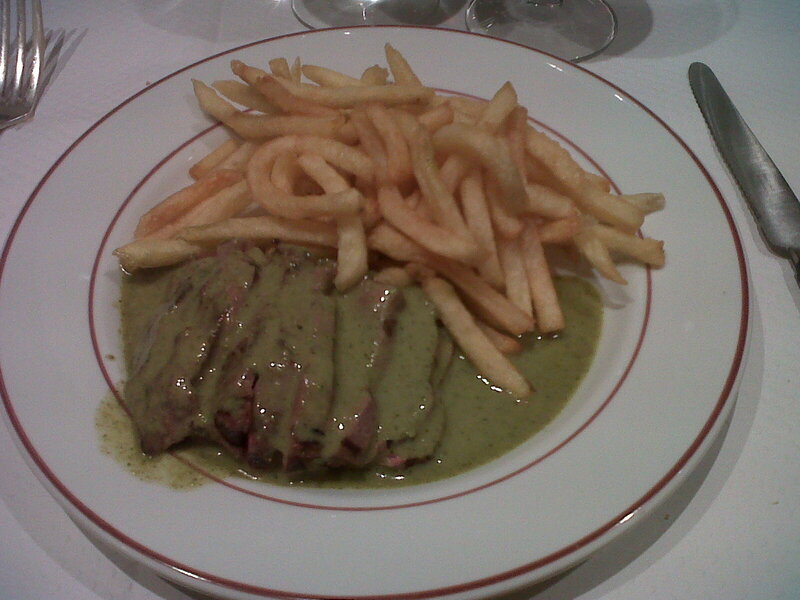 I had heard about the legend of L’Entrecote and its steak-frites-ONLY ways. This restaurant shows that the new age pop ups without menus – are not so “new age” – in fact, L’Entrecote have been serving JUST steak and french fries for the past 50 years. They have a couple of restaurants in London – we went to the one in Canary Wharf as we were already in the area (I believe they also have one in Marylebone, The City, Paris and New York). We were seated straight away and the waitress explained to us (in a French accent), “We only have steak here – You can choose for it to be done blue, rare, medium… well done… etc”. Of course I ordered mine blue. 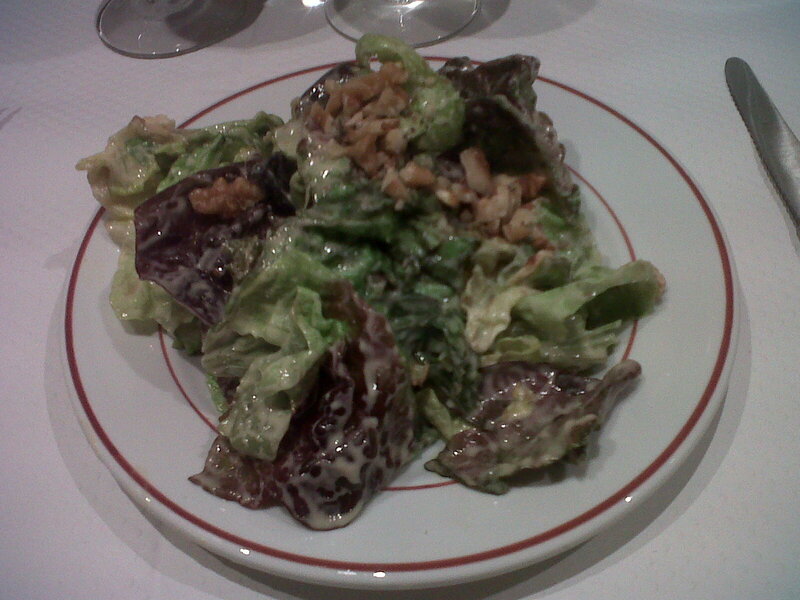 First they brought us a leafy salad, with a french dressing and walnuts. It was a nice refreshing start to the meal. Then came the star of the meal; the steak. It came with a “secret sauce” on top, which was delicious and had a pesto-like flavour to it, and a large portion of french fries on the side. They just bring two thirds of the steak to start with so that they can bring the other third of the steak to you warm afterwards. My steak was cooked just how I like – still moo-ing. It was not tough or chewy what-so-ever, in fact it was very soft and tender. When this portion of steak and fries was done, they came over with the second portion for each of us. I did not finish my first portion of fries, so I just accepted the steak and very happily finished it off. The boys, of course, devoured it – fries and all. We also shared a bottle of red wine between the three of us and the menu came to £28 each. We left with very happy bellies. Excellent choice, Thomas! Richard’s friend, Edmund Bing (that he grew up with after they met in boy scouts) and his girlfriend own The Orchard and for Hannah’s last night in London, we decided to try it out. 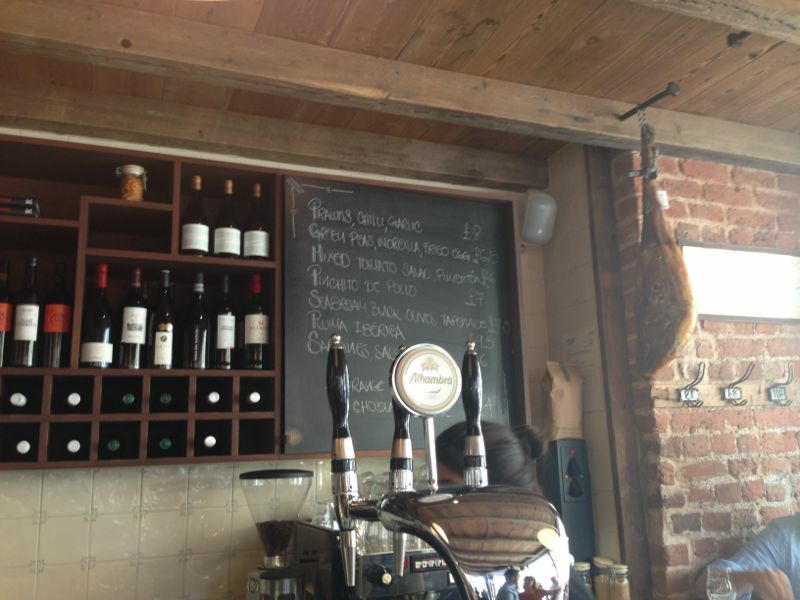 If you live in or around Brockley and you are looking for a local, I would definitely recommend trying out The Orchard. The Bings have done a great job with the place. 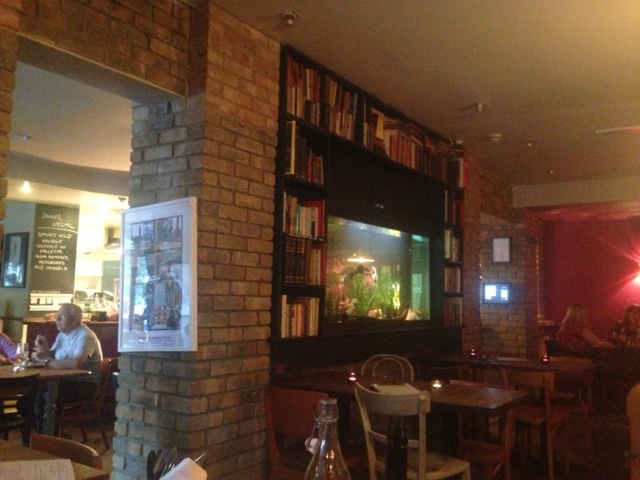 It has a very homely and warm feeling to it with its brick walls, book shelf, lamps and chilled out atmosphere. 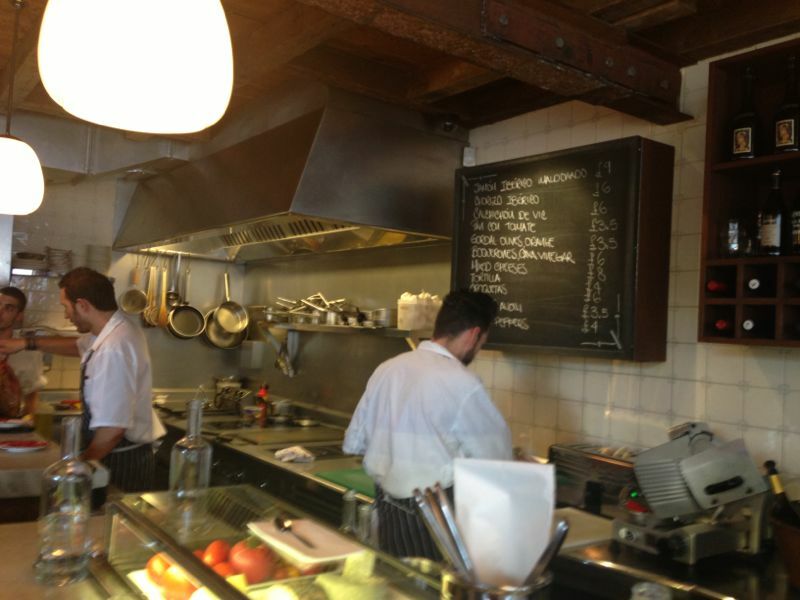 I also love that the kitchen is open and you can see the chef cooking up all the meals. They have a mouth watering menu and it was hard to come to a decision because everything sounded good. For starters we had calamari with a teriyaki plum sauce, sesame seeds and fried leeks, which added a great Japanese twist to the dish. 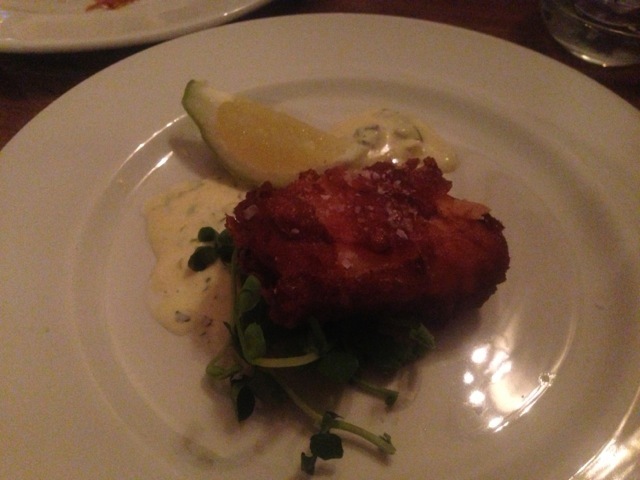 We also shared a beer battered deep fried monk fish with tartar sauce, which was delicious – crisp and light on the outside and moist on the inside. 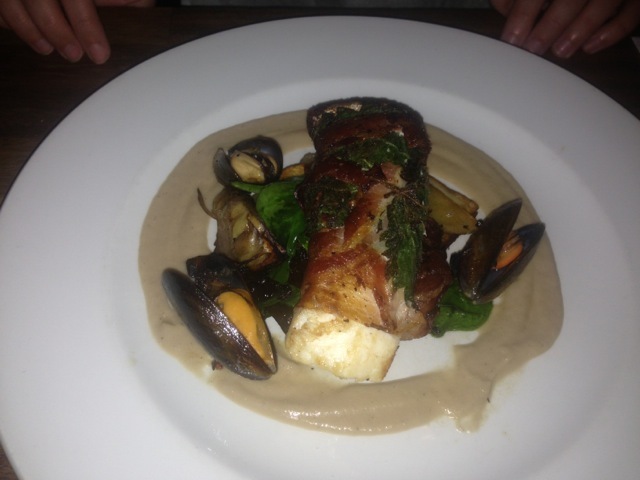 For our mains, Hannah went for the roasted wild halibut wrapped in pancetta with anna potatoes, artichokes, mussels and nestles. I went for the pan fried trout on potato puree with spinach, capers and butter. It was an absolute delight. The trout had crisp skin on one side and perfectly soft meat on the other side. 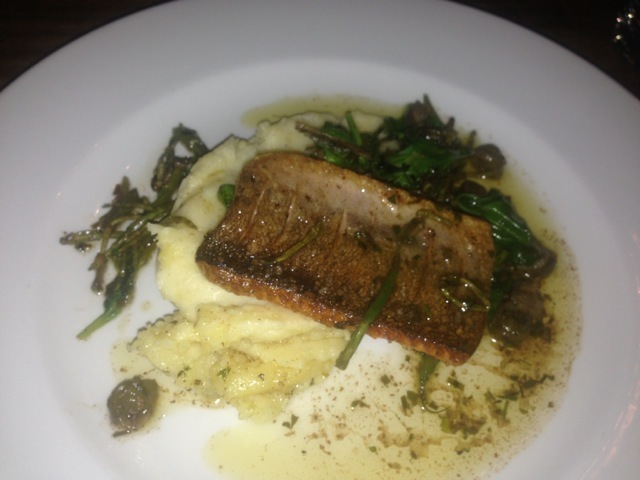 The potato puree was very smooth and it all went very well with the capers and butter. 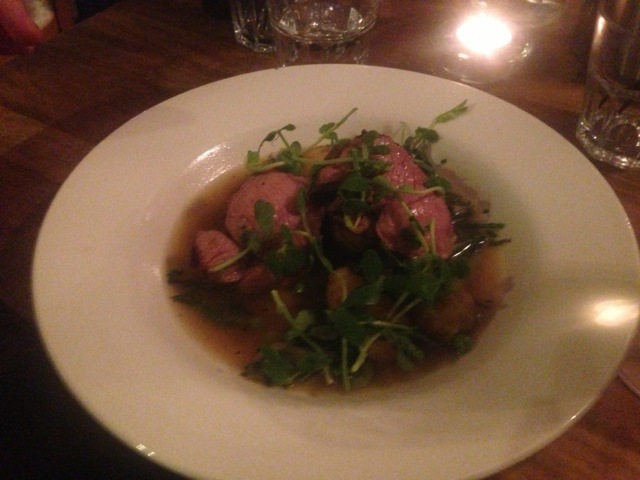 And Richard went for the lamb cutlets with lamb consomee, baby potatoes and spring greens. For dessert we had the nespoli with ginger bread and cream. 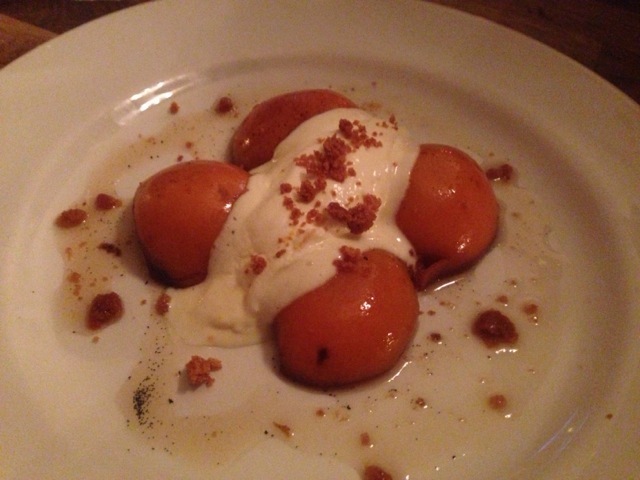 I have never tried this before but it tasted very much like baked, halved nectarines with their skin left on. There were some very interesting flavours in the dish and overall I felt as thought it was a very refreshing way to end the meal. 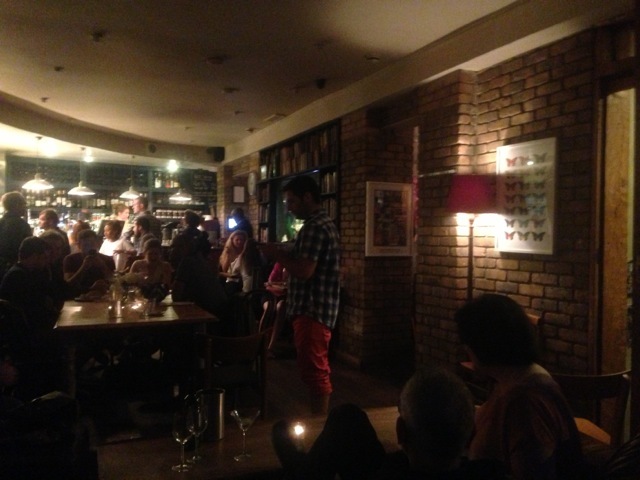 Edmund came and sat with us for a bit and told us about their new menu and head chef. The chefs love to use fresh, seasonal produce and even do a little bit of foraging themselves. Most recently they have been picking elderflowers which they have been using in their dishes and to make elderflower syrup for their drinks. I think its a great gastro pub. 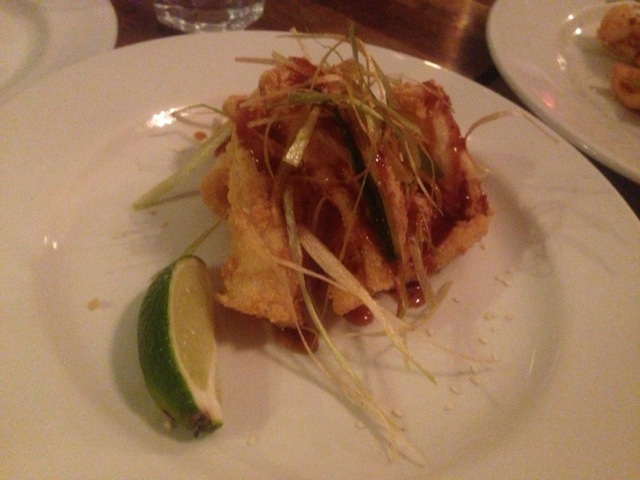 The food, the interior and the atmosphere were very much enjoyed – Thank you for a wonderful evening Edmund Bing! What to do on a sunny April day? Go for an oysters and bloody mary brunch, obviously. 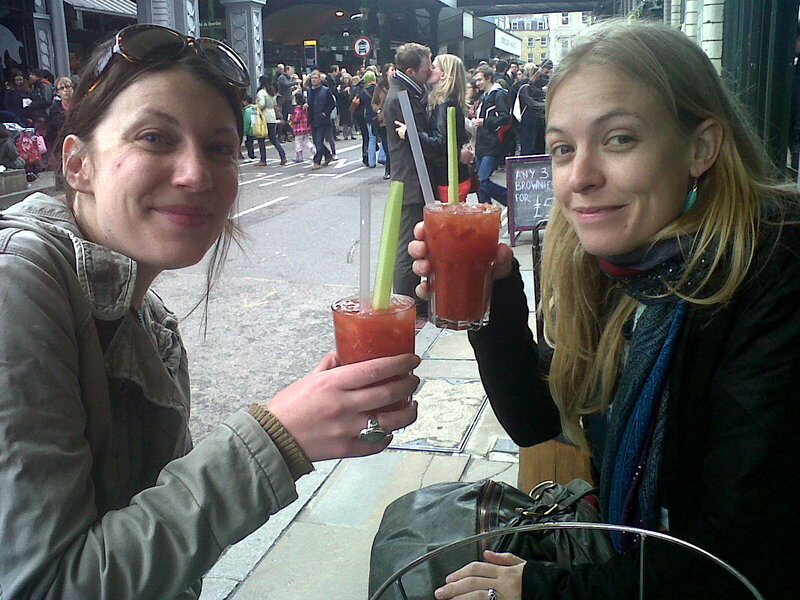 Hannah, Liz and I found ourselves at the Wright Brothers just outside Borough Market one glorious sunny April day. We sat out side where there are make shift tables made of barrels and stools. We decided on a mix of a dozen oysters (above) which were presented and explained to us by the server. From bottom and clockwise, we had Northumbrian, Irish, and Jersey shells. They were absolutely delightful and eating them in the warm sunshine, I felt like I was swimming in the sea with the creamy and fresh texture and tang from the lemon (I’m a huge fan of oysters in general, hence my dramatic explanation). 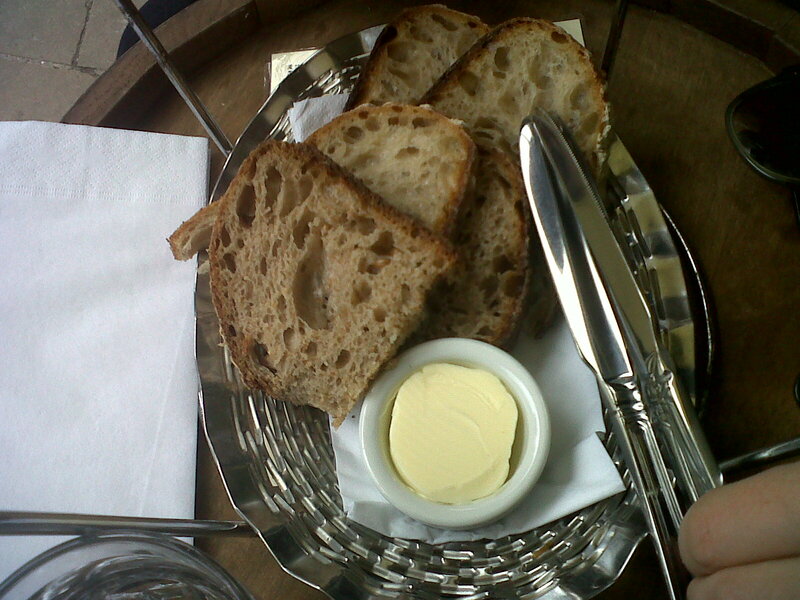 As we were waiting for the oysters, they brought us some fresh sourdough bread and butter. Delish! Overall a great way to start a sunny spring day! CHINCHIN!